A blog detailing the construction of the future home of the New England Regional Council of Carpenters. Commuters passing the Carpenters Center this week will see a series of reminders about the real meaning behind the upcoming Labor Day holiday. The Carpenters Center media wall will feature images of working people from various industries and a message to celebrate Labor Day by "Honoring Workers" and depicting the people who are "Working for our future." Starting on Monday, a series of images will rotate on the media wall, each featuring a different profession. Images will change each day throughout the week, with all of the images rotating on Labor Day. Matching images will run on the sign at IBEW Local 103, only a short distance south of the Carpenters Center along Route 93. The coordinated campaign was developed in conjunction with other unions and the Greater Boston Labor Council. Images on the sign will also be posted on CarpentersCenter.com starting Monday. Welcome to the Carpenters Center, Local 2168! Floorcoverers/Carpenters Local 2168 has moved its office space from Adams Street in Dorchester to the Carpenters Center. The Floorcoverers’ new office is located on the third floor of the Carpenters Center, along with offices for the New England Regional Council of Carpenters, the New England Carpenters Labor Management Program, Shop and Millmen Local 51, Piledrivers Local 56 and Carpenters Local 723. The Association of Energy Engineers New England selected the Carpenters Center, the new headquarters for the New England Regional Council of Carpenters (NERCC), as a recipient for their annual Chapter Energy Project Award. This award honors projects with energy-conscious design. The Carpenters Center was recognized for its outstanding use of energy and energy savings. RDK Engineers joined forces with architect and design firm ADD Inc and provided mechanical, electrical, plumbing, fire protection, audio-visual, and commissioning services for the new center located between 1-93 and Dorchester Ave. With the creation of this new three-story building, fully equipped with a 30-foot LED sign that is used to promote the carpentry trade, motorists on the Southeast Expressway have a new landmark to appreciate on their commutes in and out of Boston. The facility was converted from an abandoned two-story commercial building to a three-story, 75,000 s/f center which will train 2,000 students per year. In addition to student classrooms, the renovated space also contains state-of-the-art offices, a conveniently located bank, and an eye-care center for union members. The center also includes energy-efficient lighting features such as incandescent lights with motion sensors and automatic shut-off. "RDK Engineers has long been committed to sustainable and energy-efficient design practices," said RDK principal Pat Murphy. "The RDK project team truly enjoyed partnering with the New England Regional Council of Carpenters and ADD Inc on a center that was designed to suit the needs of everyone in the Carpenters' Union. We are proud to have been a part of this unique opportunity." You also read this story on the NEREJ website. Welcome to the Vision Center! The Carpenter Vision Center is owned and operated by the New England Carpenters Health Benefits Fund. 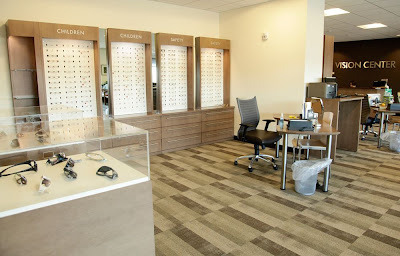 It offers complete eye examinations and the largest selection of frames available under the Plan. 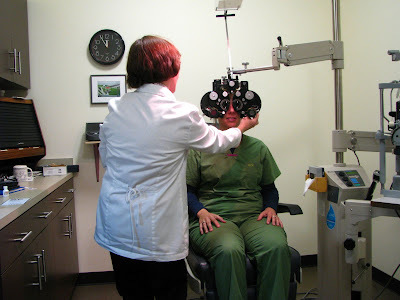 The Vision Center is located at the Carpenters Center, 750 Dorchester Ave, Boston, MA and offers afternoon, evening and Saturday appointments. 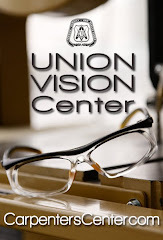 Carpenters Union members, spouses, and children are eligible for routine eye exam and glasses (2 pairs of single vision-distance and near – or 1 pair of bifocals) once every two years. The facility offers over 200 Covered Frames for men, women, and children and over 80 Collectors Frames for men and women available for a $50.00 co-pay. A large selection of Safety Frames is also available. 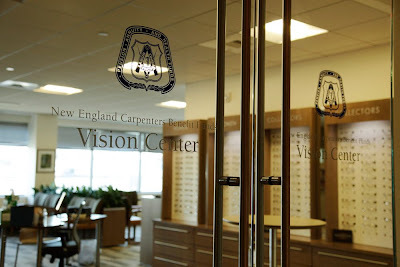 While the facility is utilized mostly by members, spouses, and children of the Carpenters Union who have benefits through the New England Carpenters Benefits Funds, the facility is also a Davis Vision Provider. Any outside individual who has Davis Vision as their Vision Benefit is allowed to receive an eye exam and glasses through the Vision Center. The cost is billed through their Vision Insurance. The Vision Center has three exam rooms and four doctors. There are two Optometrists who perform routine eye exams, one Ophthalmologist who comes in once a month to see patients with medical issues and one Contact Lens Doctor who is available on Wednesdays only. The Vision Center is conveniently located off of Route 93 (get directions here) at the Carpenters Center, 750 Dorchester Ave. There is plenty of parking available; the facility is an 8-minute walk from the Andrews Square station. Call 617-782-0100 to make an appointment. The New England Regional Council of Carpenters (NERCC) recently received a rebate check in the amount of $103,880 from NSTAR Electric. The rebate was part of NSTAR’s Construction Solutions Program, which provides incentives for purchasing and installing high-efficiency equipment for us in commercial and industrial operations. Before breaking ground at the NERCC’s new headquarters, the Carpenters Center, various rebate and incentive programs were examined as a means to not only cut costs, but improve overall efficiency over the lifetime of the building. NSTAR’s Construction Solutions Program was the best fit in terms of the lighting line and dealt specifically with the purchase of light fixtures and switches throughout the building. In order to qualify for the program, certain terms and conditions had to be met. The project had to be completed in one year, in this case by May 11, 2010; the application had to be submitted with all paid invoices for material costs and labor; and a post installation verification had to be completed, verifying that the equipment was installed and consistent with sound engineering practices. The application had to be received and approved by NSTAR before construction began. The lighting at the Carpenters Center has individual controls every regularly occupied space. Private and shared offices have two-level occupancy sensors, individual workstations have flexible, integrally-switched task lights, and classroom/conference spaces have multiple levels of switch controls to allow for adjustment of lighting levels in accordance with the activity happening in the space. By selecting incandescent lights with motion sensors and automatic shut off, the Carpenters Union hoped to save over 30% off of total annual consumption. As part of its building plan, the Carpenters Union utilized its own Commissioning Study as an extra review process in the design and purchase of various elements throughout the building, including the lighting. This separate layer of review assured the Carpenters Union that the organization is given some kind of refund or equivalent in its operation on a daily basis, that true savings would be realized over the lifetime of the building. Substantial completion of the project happened in January 2010, well ahead of the May deadline as set by the rebate parameters. With the deadline met and the application otherwise complete, the final step was to pass the post installation verification, during which a throughout audit of the system took place, with every fixture examined throughout the building. After passing the inspection, the rebate check was issued to NERCC. The lighting line for the Carpenters Center, installed by union contractor McDonald Electric, was $217,000. After passing the final inspection, the NERCC was issued a check in the amount of $103,880. At the time the check was issued, representatives from the Carpenters Union were told that the check was one of the largest to be issued by NSTAR under this program. “We have training programs for our members to learn the fundamentals of Green Building and prepare for LEED AP certification, however it’s very difficult to preach about the virtues of these practices if we’re not doing it ourselves at home,” notes David Dow, NECMLP Special Projects and Facilities. Joanne Goldstein, Massachusetts Secretary of Labor and Workforce Development paid a visit to the Carpenters Center this week to learn more about apprenticeship and upgrade training. H.W. Ellis Painting Company, Inc.
Oak Roofing and Sheet Metal Works Co.